Join Actors Point Theater for a special holiday event unlike any other for one of the funnest, entertainment shows of the holiday season! Rudolph, Frosty, scrooge, Santa, Nutcracker, Grinch, Charlie Brown, Ralphie, Gift of the Magi, Wonderful Life WHEW! The mission of Actors Point Theatre Company is to enrich the cultural lives of residents of Middle Tennessee. The Actors Point Theatre Company will endeavor to engage, inspire, entertain, educate, and challenge audiences with theatrical productions that range from the classics to new works; we will train and support the next generation of theatre artists; we will provide arts education programs that promote life-long learning to a diverse community; and we celebrate the essential power of the theatre to help stimulate the communities we serve both culturally and economically. 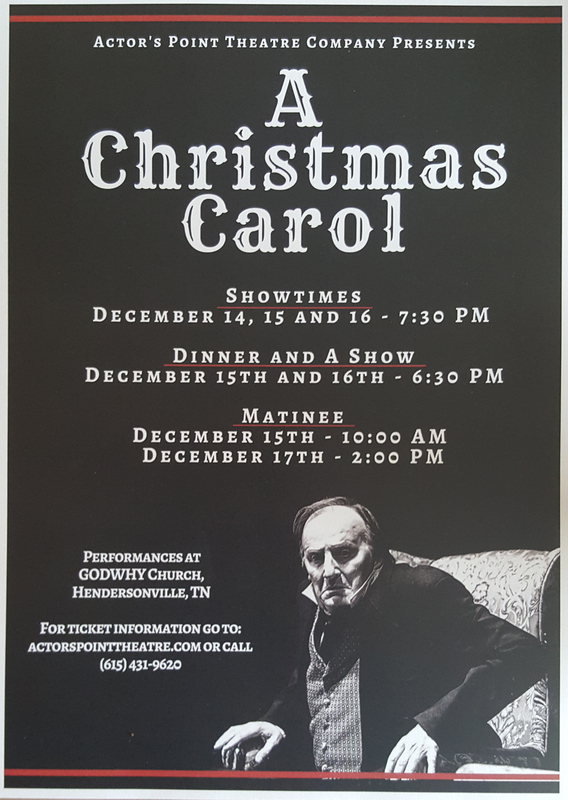 Enjoy a live performance of the classic, A Christmas Carol with dinner presented by the Actors Point Theatre in Hendersonville, TN. Performers include locally and nationally known professional actors whose stage, film, and television experience has brought new energy to professional theaters throughout Middle Tennessee.